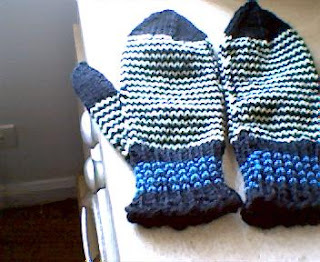 These mittens are for the latest Afghans for Afghans campaign. The yarn is just leftovers from other projects. The pattern is from Ann Budd's "Knitter's Handy Book of Patterns." The deadline for this campaign is March 1, so I might try to knock out another pair before then. They're pretty quick and easy, and it's fun to experiment with various color combos. good job! they turned out really nice. Thanks, Lynette! The deadline for the campaign is Monday, and I don't know when I'll be able to get to the post office to mail them. *sigh* Maybe I'll just hang onto them and send them with the next campaign.